In this series, we will feature a popular marketer, inspirational speaker, or small business owner every financial quarter, marking the four that make up a calendar year. We’ll share their savvy quotes, golden tips, and more ways to access the most sought-after tastemakers in the marketing world. To kick off Q2, meet writer and speaker Brendon Burchard! I attended his High Performance Academy last year in Phoenix, Arizona and it was incredible! I still refer to my notes and have subscribed to his podcasts and read his book! You might say that I am President of his fan club! 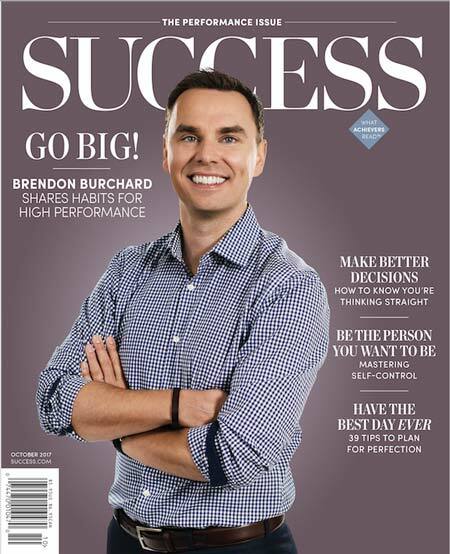 Success Magazine cover boy, New York Times bestselling author, and international teacher: Brendon Burchard is a force to contend with — and one who leads with the utmost generosity. Dubbed by Forbes as “the world’s leading high-performance coach,” Burchard credits surviving a car accident as a young man with his life credo to make work that matters. But how does Burchard achieve this? See below to find out how you can follow in Burchard’s legendary footsteps. Even if you don’t have a Twitter account, you can view Burchard’s public (and inspirational) profile for frequent updates of his messages and goings-on. With over 79,000 followers, @BrendonBurchard preaches everything from commendable goals his father taught him to his latest podcasts episodes. Hear advice straight from the horse’s mouth in Transformation Week, a free 7-day online challenge that “helps you set 2019 goals and create the mindset and daily habits needed to achieve them faster.” Enjoy video training, life assessment, and more perks in this weeklong program shepherded by the life and game changer himself. Burchard’s YouTube channel boasts almost 200 videos so you can see his techniques and motivational speeches in action. The online forum offers a plethora of topics — from overcoming fear and how incredibly successful people think to reprogramming your mind and tips for self-motivation — to keep you more than occupied as you seek to improve your habits of all stripes, business and personal. And if you prefer to see Burchard live in person, subscribe to his channel and find out when he’ll be coming to your area! This entry was posted in Blog and tagged authenticity, leadership. Bookmark the permalink.